You’re the Coolest…. Purple Onion Designs(video)! I have a video to share for Purple Onion Designs and this is the perfect card for Australia at the moment as we are heading into a heatwave and I’m off to Victoria today to celebrate my Dad’s 70th birthday where this week the temperature is going to be 44C (that 111 F) it will be a gentle reminder just why I live here in the sub tropics. Thank goodness for the miracle of air conditioners and swimming pools… and there may just be a little champagne too. I’ve linked the stamps below or you can head to Purple Onion Designs yourself. Other Supplies: Copics – BG13,15. R02,05,27. T0. W0,2. E25,29,31. C5,7,9. Y13,17. YR12. < Previous Sprinkled with Sweetness at Muse! Next > You Party Animal…. at Scrapbook Boutique (video)! The owl is so super cute and definetly cool! Lovely card and fabulous video (as always)! so cute. love the coloring. Happy New Year, Theresa! Oh, this card is absolutely adorable! I love how you have this little guy perched on the bench…so cute! Stay cool…and enjoy your Dad’s birthday!!! Stay cool while you enjoy the celebrations here in Vic. A bit of celebrating in our house today, Mr M is 16 today. Whoa, simply adorable, Therese. Eeeek, stay cool! I so love watching ur videos 🙂 this is such a cool card!! A very sweet and cool card. Have a great time with you dad! Love the stamp and how you’ve used it. Best of luck in the heat. I’ve never understood why anyone would voluntarily live in Victoria – it can never make it’s mind up. 😉 (Only joking Vic!) Have fun with your Dad and wish him a very happy birthday. 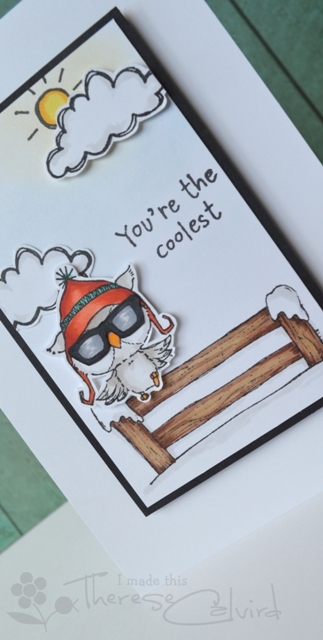 I love that cool owl stamp Therese and you card is such fun! Love it. Hope you stay cool on your trip to see your Dad. That’s one decked out owl!! Love your coloring. Cool card, Therese! Just love watching you complete a card! OUCH! THat’s some seriously hot weather….yuck! 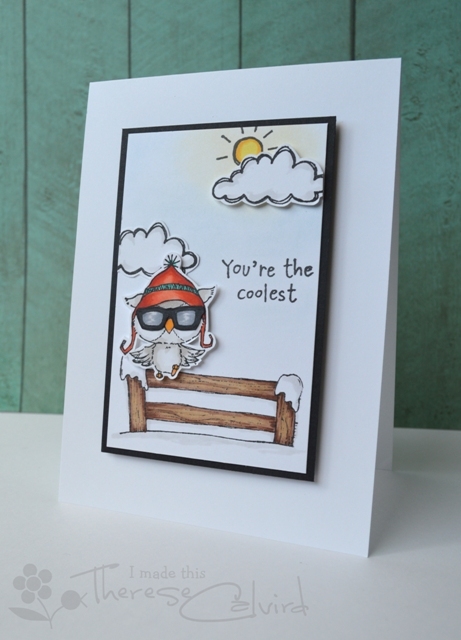 I LOVE this fun card – such a fab little scene! Hope you had a lovely time in Victoria and you survived the heat! Very cool card indeed.